It’s old, it’s leaky, and, the pump just went out again. You’ve come to the end of your patience for repairs and quick fixes, and now, it’s time to rid yourself of that hot tub on your patio or deck. It’s been there for years and you’re not exactly excited to see what’s lurking behind it or underneath, but, it’s definitely got to go. Move any surrounding items, including patio furniture. This will give you plenty of room to move about, plus, you’ll likely have to do this anyway to get the hot tub out of where it sits. Take off the cover and drain it. 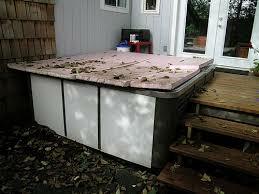 If there’s a cover over top of your hot tub, take it off, then, drain out all the water, if necessary. Some people leave it filled to make it easier to use, but that water will make it too heavy to move. Turn off the electricity powering the hot tub. You should do this first at the breaker box, then, unplug it from the electrical outlet. You might have to pull off or open-up a panel in order to get to the electrical connection on the tub itself. If you can, pull the cord out and wind it up to avoid tripping over it. Disconnect the water supply. Using channel locks or an adjustable wrench, disconnect the water supply to the hot tub. Place the pipes off to the side where you won’t trip over them. Remove the skirt. With a screwdriver, you can unfasten the retaining screws holding the skirt to the tub. Then, put the skirt panels out of the way and you’ll be ready to remove the tub itself. When you need hot tub removal and disposal, just phone 800-433-1094 or visit Junk Garbage Removal.